There's nothing quite so frustrating as being a music writer and not being able to recommend a good disc. Even though I'm hardly a professional critic, I've been writing about classical music for almost a decade, the last two full years here on Classical Net. I know the lay of the land. 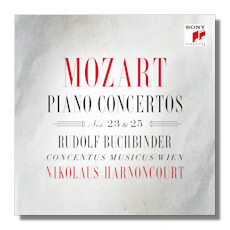 Rudolf Buchbinder has been an absolute master of this music since before I was born, and Nikolaus Harnoncourt's Mozart remains fascinating despite the fact that he's been playing this music since before my parents were born. So why am I upset? Nothing to see here, folks! Sony Classical does not mark anywhere on the front of the box that these are recordings on fortepiano. The little blurb on ArkivMusic says nothing about a fortepiano. That's a problem for me. Since Buchbinder has already recorded these works on a very good piano in live recordings on Profil, I see absolutely no reason to re-record these pieces on a "period" instrument that has unquestionably less dynamic range. And what does Harnoncourt gain? He just played this role with Lang Lang on a 2014 Sony album (this is from 2012) and he's also revisiting the symphonies and serenades. In short, these artists, who have already given us outstanding takes on this music, are asking us to invest again because the orchestra is different and the solo instrument has changed. I'm not going to bother pretending that we collectors don't do this, but at full price, the results better be amazing. Unsurprisingly, they are not. The fortepiano is an occasionally revelatory but mostly ugly instrument that is thankfully not in use today. As a historical item it is doubtless fascinating, but as a viable vehicle for Mozart it comes up short. As for the argument that the composer himself would have used one, that again falls under a historical quibble. The point is that no fortepiano comes close to a modern grand in terms of color and expression, and I say that as a writer who has very favorably reviewed issues that utilize the fortepiano as the main attraction. That's what it is, a gimmick and a marketing ploy. Sometimes, it works better than others. Nikolaus Harnoncourt does some really cool things in terms of woodwind detail but otherwise stays out of the way. Buchbinder remains a fabulous Classical period artist who is too traditional and serious an artist for this kind of nonsense. The orchestra plays well, but with little sense of discovery or enjoyment. The latter two qualities are frankly lacking from this whole project: a dud.